Emet Ministries Torah Portion A shorter commentary on each torah portion. Sheepfold Gleanings Torah commentaries by Carl and Julie Parker of the Messianic Israel Alliance. They offer a unique and valuable perspective. Please note that the listing is in reverse. Waters in the Wilderness Natan Lawrence’s torah teaching for adults. It has a quick outline, many open ended discussion questions, and a thorough teaching on the haftarah portion. Portions are listed in reverse. Hebrew 4 Christians Here you will find a quick summary of the plot and characters, complete with helps like family trees. It also gives a quick look at the haftarah and brit chadashah. El Shaddai Ministries Mark Biltz has notes and video teaching for each portion. He puts emphasis on the hebrew language and spends time on the Gospels and Acts as well. Follow Torah Family Living’s board Torah portion activities on Pinterest. Challah crumbs – This site has lots of little goodies to go along with each Torah portion. They have a podcast, menu ideas, crafts, mazes, and discussion questions. Aish – We love their coloring pages and read aloud stories, which really help to apply what we have learned in the portion. Torah School – We help contribute to this work in progress where you will find ideas and links to work the Torah portion right into your homeschool day. Cohen Cubs club – This site does require you to register for free, but it is packed with resources, links, crafts, etc. relating to each Torah portion. Context for kids – Tyler Dawn Rosenquist has a video series to help children understand the culture behind the Torah portions. By the way, adults love it, too! Project Torah portion – This site has audio recordings of each Torah portion read by a family with lovely background music. My First Torah – This is my book of child friendly Torah portions. It is great as a family read aloud or for younger children to read aloud. The illustrations were even drawn by children. 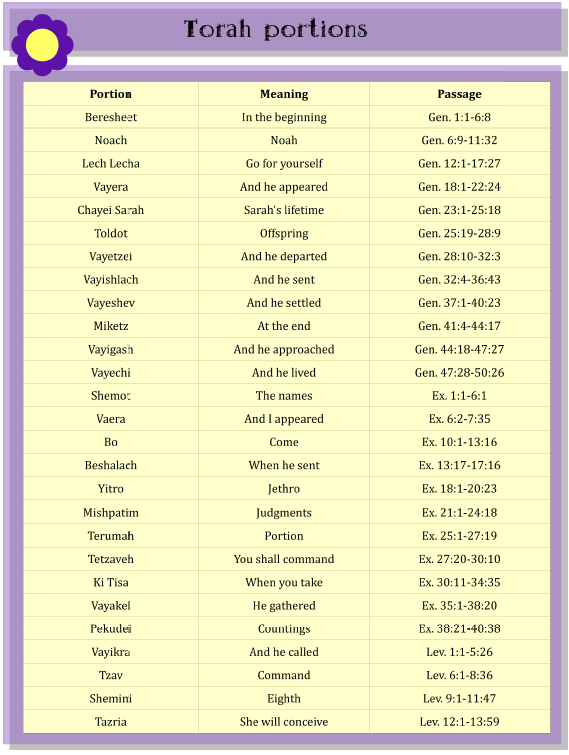 Make reading the Torah portion even easier with our free printable! It’s a two page pretty printable of all the Torah portions and the verses. Sign up for our email list below to get your copy, along with some other great freebies.